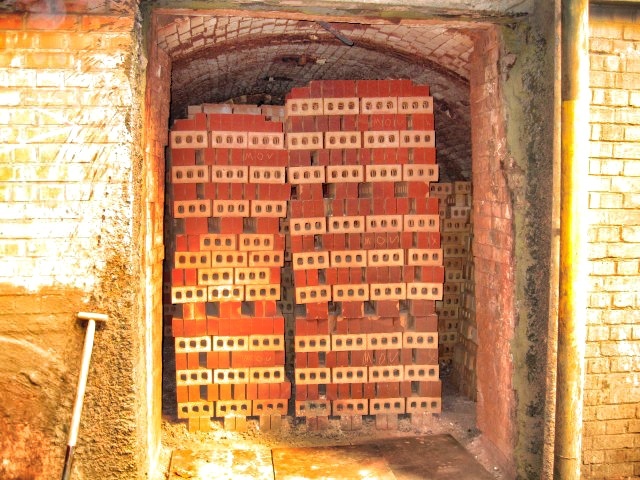 Twelve members of the society had a very enjoyable day on 7 September visiting Northcot Brickworks near Blockley, Gloucestershire, followed by a trip over the border into Warwickshire for an afternoon walking tour led by David Kennett, BBS Information Editor and resident of the town. 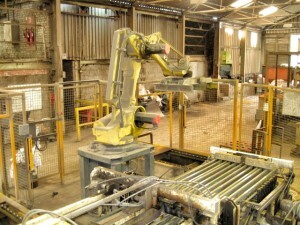 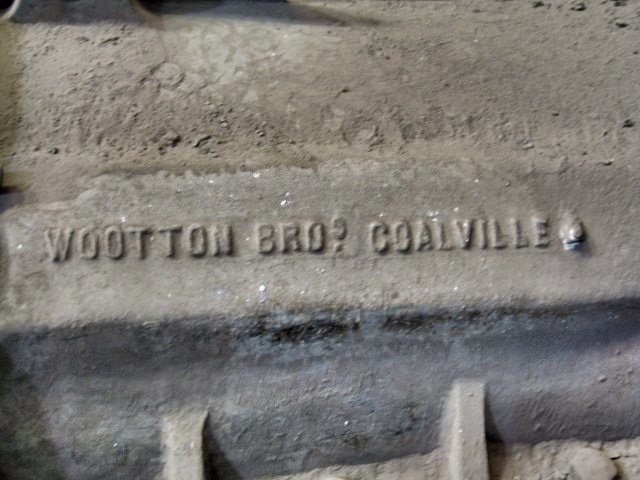 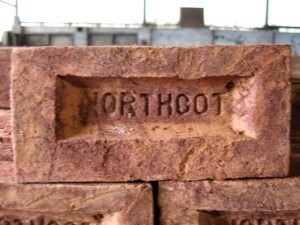 Northcot Brickworks, which is part of the EH Smith Group, produces 12 million bricks per year, with a range of 50 lines covering both handmade and machine made products (see http://www.northcotbrick.co.uk/). The plant dates from 1925 and was originally started by Spencer Churchill, a cousin of Sir Winston, to meet a demand for bricks and to give employment locally. One very famous building constructed from Northcot Bricks is Battersea Power Station, now undergoing a major transformation. 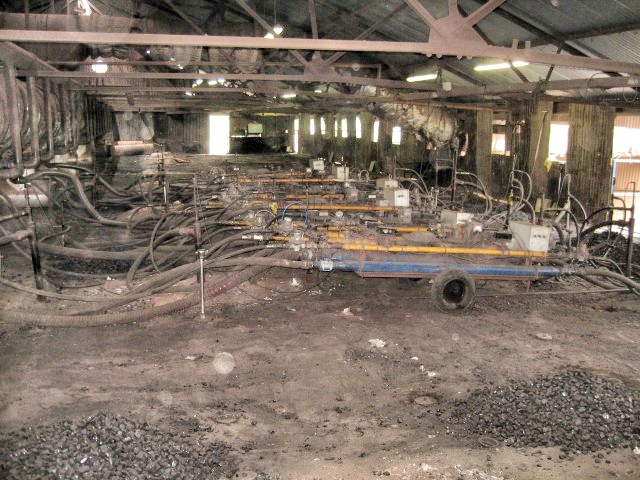 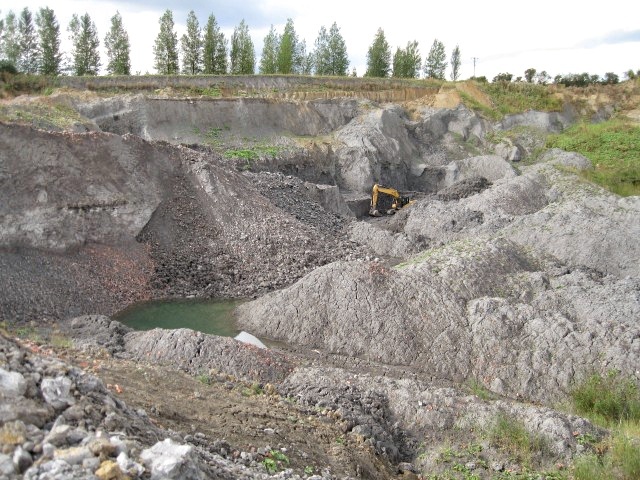 The clay, Charmouth Mudstone (formally Lower Lias) is won from the adjacent quarry, and then processed to either a modern extruded wirecut line or through an original Wootton Bros. extruder that produces material for the hand making lines. Whilst the process is very traditional, the use of a robot and fork lift trucks reduces the manual operations to a minimum. 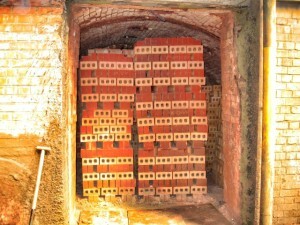 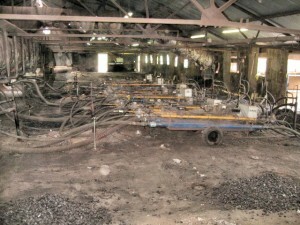 After drying, the bricks are fired in a 14 chamber Staffordshire kiln, using a mix of coal and gas to reach the top firing temperature of 950°C. 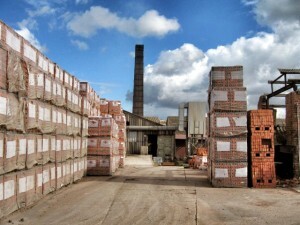 After firing,the bricks are sorted and packaged ready for use. The Society wishes to thank Michael Brown and Dale Moss, for their time in arranging and conducting the tour. 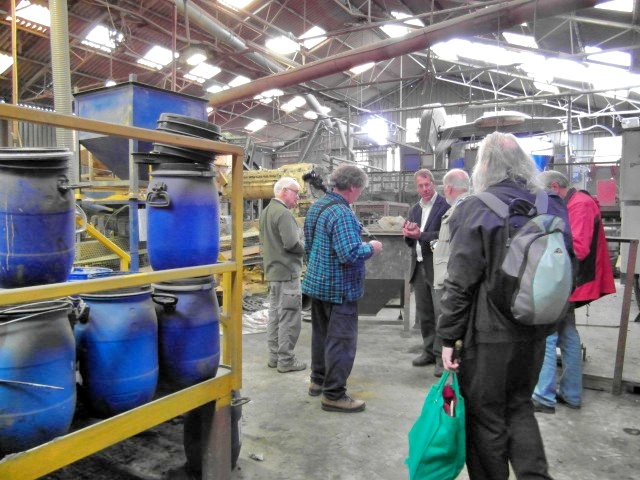 After lunch in a very nice tea shop in Shipston, David Kennett led a very informative tour around this attractive market town. 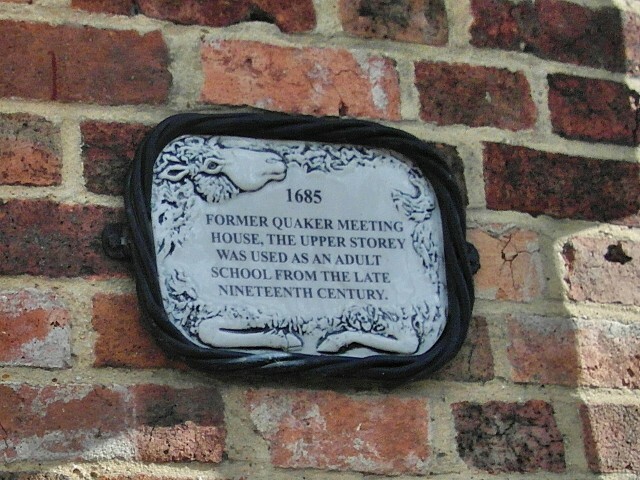 Of particular note was the mix of brick and local stone used in many of the buildings, the cluster of insurance company fire marks in Sheep Street, a restored workhouse converted into social housing, and a Victorian Brewery building now converted to apartments. 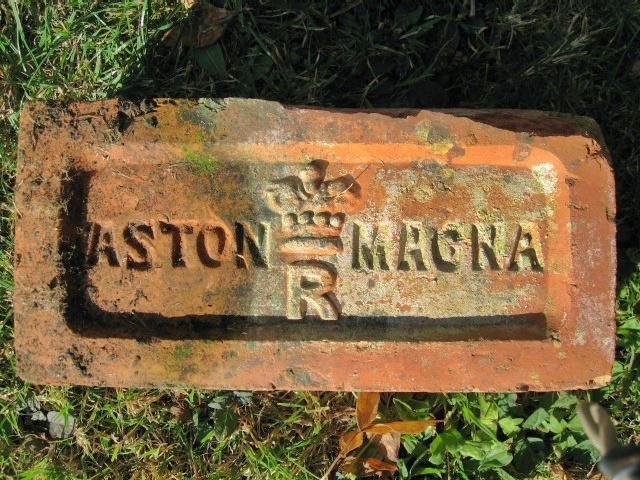 During the walk a brick from the former Aston Magna Brickworks was photographed. The crown and “R” within the name are both interesting and worthy of further research. 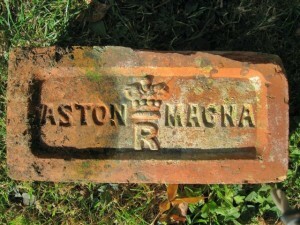 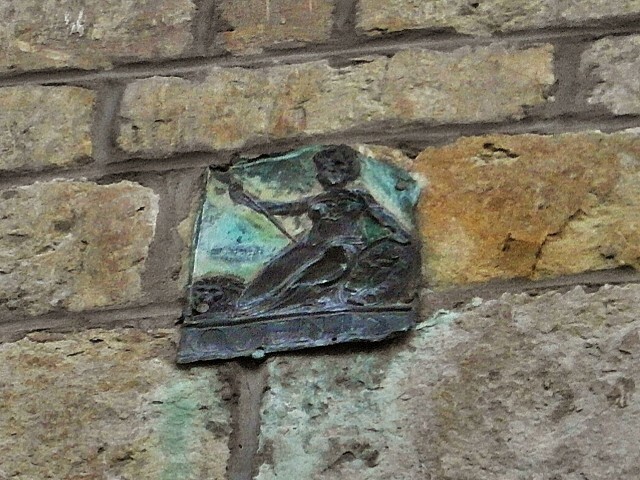 A brick found during the tour of Shipston — any information would be appreciated?